Note from LeftEast editors: The main political event of 2018 on Russia’s domestic scene was probably the pension reform and the unsuccessful resistance against it. In this piece published in Russian in Sotsiologia vlasti 30(4)2018 co-translated for LeftEast by Kate Seidel, Ana Gurau, and Dasha Vodchic, Ilya Budraitskis takes this episode as a lens on the government modus operandi and on the logic driving the different segments of the opposition. The Russian authorities’ actions in as they were preparing to raise the retirement age in summer 2018 involved both a thought-out strategy and a relatively weak propaganda component. Analyzing this combination will help us to assess both the potential for a mass movement against raising the retirement age and the reasons it remained unrealized. In their attempt to ensure mass support for the pension reform, bureaucrats, government experts, and loyalist media outlets tended to use three basic arguments that can be categorized as “necessity,” “rational advantageousness,” and “an active long life.” According to the first of these, the necessity of the reform was determined exclusively by the aging of the population and the decrease in the working-age population. The country’s pay-as-you-go pension system meant that there was no way out of this situation other than raising the retirement age. The second argument was that carrying out the reform would allow a meaningful increase in the real size of pensions, and the third was essentially that raising the retirement age would allow people to lengthen the active phase of their life and create new possibilities for self-realization. It is hard not to notice that the last two arguments contradict the first as far as the government’s assumed motive for the reform goes, which seriously undermined the trust of the audience to which these arguments were presented. Nonetheless, the arguments had in common the aim of casting doubt on the idea that different generations have common interests and undermining solidarity between them: those who had already reached the retirement age must have won out at the cost of those who were about to retire, while the youth, in turn, was assumed to be interested in lessening the burden of supporting the growing number of retirees. This approach of stimulating competition between individuals and generations was clearly based on the existing atomization of Russian society and the younger generation’s relative openness to neoliberal rationality and suspicion towards all forms of income redistribution (Yudin, 2018). Nonetheless, the level of support for the reform turned out to be low among all age groups (Goncharov, 2018), which reflected both a general distrust of government welfare policy and a deep-rooted conception of pensions as “compensation for labor that people expended for the good of the state and society and for the creation of common goods” (Goncharov, 2018). In other words, as with the monetization of benefits in its time, the pension reform was perceived not only in the context of material losses, but also as an attack on the principles of justice and the dignity of the majority. In the end, this unconvincing propaganda only served to underline the existence of an endangered common interest and create additional grounds for articulating the majority, the “us” opposed to the government that was necessary for a potential social movement. At the same time, the strategy of passing the pension reform was well-prepared: Prime Minister Medvedev’s announcement and the bill’s hearings in the State Duma came during summer vacation and also coincided with the FIFA World Cup, which was presumably intended to crowd it out of the media agenda. In addition, the World Cup essentially allowed for a temporary ban on all public street protests in all the cities where games were held (including Moscow and St. Petersburg). It is important that the plan for the pension reform was presented as an initiative of the government, supported by the ruling United Russia party, while President Putin consistently refrained from voicing explicit support for the project. In this way, the parameters of the reform announced by the government could be framed as the basis for a “dialogue,” to which all “constructive” players (the parliamentary opposition and unions) were invited, and from which were cut off anyone who “politicized” the problem of raising the retirement age, i. e. used it in their own political interests separate from the interests of the majority. This distinction marked the basis for the subsequent lack of unity in action by those opposed to the reform, which in many ways was a defining cause of the fact that mass hopes for the appearance of a civil society protest movement went unfulfilled. I propose that such a movement could have arisen as the result of one of two scenarios: 1) had there arisen a “united front” that, by instituting a public campaign against the pension reform, bringing together all the political forces and civil society organizations that opposed it, was able to initiate and organize nationwide protests, or 2) had there been a “spontaneous” wave of protests, i.e. one that more or less repeated the situation in 2005, when local demonstrations in “typical” Russian cities were able to create an image of “worthiness, unity, numbers, and commitment” (Tilly, 2004, p. 3) that then spread throughout the country. It is hard to summarize all the reasons why the “spontaneous” scenario failed to emerge, but one of them may be the non-existence of the “typical” Russian region or city that such a symbolically important action would have needed to take place in. Although the consequences of the pension reform affected the interests of the majority of citizens, it was a sensitive issue for different sectors of the population in different parts of the country. Thus, while the regions of European Russia are distinguished by a higher proportion of residents of retirement and pre-retirement age, the largest amounts of economically vulnerable residents (for whom pensions and welfare payments are more significant as a source of income) are concentrated in the North Caucasus, Far East, and Siberia (Petrov, Kynev, and Titkov, 2018). Nonetheless, a mass protest in one of these potentially protest-inclined regions could certainly have created an image of a mass movement through which representatives of a wide variety of social and age groups could have expressed themselves. Another potential definitive reason was the phased implementation of the increase in the retirement age, which precluded the shock effect of a one-time, simultaneous loss that determined the character of the protests against the monetization of benefits in the Moscow Region in winter 2005. In this situation, the realization of the first scenario—a public campaign uniting all opponents of the reform—turned out to be the only chance for a movement capable of articulating the general mood of protest against the breaking of the “social contract on old age” (Gaaze, 2018) and government austerity policies to appear. To found such a campaign, it was necessary firstly to create a relatively neutral space for collaboration between political groups that had earlier distanced themselves from the possibility of any coordinated action on principle, and, secondly, to create an atmosphere of pressure from below that would make refusing to collaborate a real risk of loss of support and marginalization for each of these political groups. Thus, the establishment of such a public campaign in the current Russian context would have required a reevaluation of the location of the “para-state parties” (March, 2009, p. 505) [the KPRF (Communist Party of the Russian Federation), LDPR (Liberal Democratic Party of Russia), and A Just Russia] in the system of “electoral authoritarianism,” as well as the official unions (FNPR), which are integrated into this system. At the same time, it would have demanded a strategic change of course on the part of the movement of Alexei Navalny supporters, the personalistic character of which has always been tied to a refusal to enter any coalitions or make political decisions collectively. In other words, the possibility of creating such a united front against raising the retirement age could have not only changed the government’s plans in this area, but would have also meant a serious challenge to the existing political system capable of leading to changes within the established “hegemonic bloc” (March, 2009, p. 510). It is clear that such a public campaign could only have appeared through overcoming the resistance of practically all potential participants, who were distinctly not open to rethinking their current position in the existing political order. Thus, the problem of the pension reform and the mass expectations for a social movement surrounding it turned out to be inescapably connected to the defining characteristics of the political composition of the Russian regime and the place that both “para-state parties” and independent opposition forces occupy in it. To support this thesis, we will attempt to briefly review the key developments in protest actions that took place in summer and fall 2018, as well as the roles that various political forces played in them. 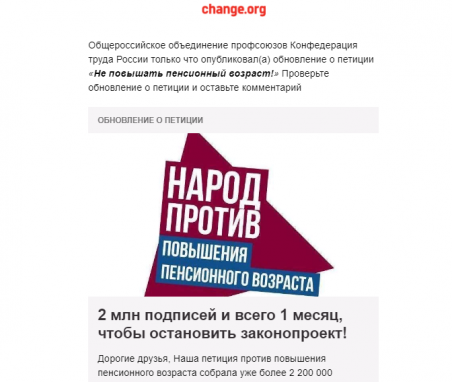 Soon after Prime Minister Medvedev’s introduction of the pension reform bill, a petition in protest was published on the site change.org; in a week, it gathered more than a million signatures (and by the end of July the number of signatories had already exceeded 3 million) [KTR Petition, 2018]. This petition was created by the Russian Confederation of Labor (KTR, Konfederatsiya Truda Rossii), a coalition of labor unions that ideologically and organizationally positions itself in opposition to the official unions (FNPR, the Federation of Independent Unions of Russia/Federatsiya Nezavisimykh Profsoyuzov Rossii). Having inherited the late tradition of the “free unions” of the late 80s and early 90s, the KTR has spent the last decade supporting unionization drives in cases of labor disputes in both corporate firms and the public sector. The Confederation of Labor has also always distanced itself from direct political affiliation, although it has declared the necessity of independent “political representation of the unions” (KTR Declaration, 2011) and regularly worked with various extra-parliamentary left groups. At the same time, this union coalition can’t be said to be entirely excluded from the existing political system: Boris Kravchenko, the President of the KTR, is a member of the Presidential Council on Human Rights and represents the unions on the Russian Trilateral Commission, while Vice President Oleg Shein is a State Duma deputy affiliated with the party A Just Russia. At the end of June, KTR declared its readiness to create an organizing committee for unified action, which representatives of the parliamentary opposition, extra-parliamentary left-wing groups and public organizations were invited to join (Kudyukin, 2018). According to KTR’s plan, this was not just about coordinating efforts, but about a uniform public campaign that could attract ordinary activists, who did not belong to any of the participating organizations. The campaign, called “The People Are Against Raising the Retirement Age,” could have given the protests against pension reform a symbolic coherence and united them around common demands. The initial success of the petition on change.org, largely due to its non-partisan character, showed the potential of such a campaign. At the same time, it is important that the petition contained not only criticism of the government’s plans but also offered an alternative for scrapping the chronic deficit of the Pension Fund: fighting against work in the shadow economy and the subsequent “legislative powerlessness of workers, which does not allow them to effectively fight for their labor rights” (KTR petition, 2018). Thus, the alleged general demands of the “The People Are Against” campaign linked protest against pension reform with a change in the balance of labor market forces in favor of workers, the implementation of the principles of the “welfare state” declared in the Constitution and the strengthening of the role of trade unions in Russian society. The organizational model and nature of the demands of the “The People Are Against” campaign, as will be shown below, largely used the experience of movements against “austerity” policies and neoliberal reforms in the EU and Latin America. The main difference—and the main weakness of this campaign—was the inability to create a network of unaffiliated activists on the ground, who could put enough pressure on political parties and force them to act together. The second significant factor in the failure of the “People Are Against” campaign was that its leaders quickly lost the initiative to represent the protest against pension reform, which they obtained for a short time after the success of the online petition. Parliamentary and extra-parliamentary political forces, particularly the Communist Party and Alexei Navalny, also immediately indicated their disagreement with the pension reform plan and called for protests (Resolution V of the Plenum of the Central Committee of the Communist Party of the Russian Federation, 2018; Efimova, 2018). However, these appeals suggested autonomous campaign management; they were not associated with the need for unified action, and most importantly, they were not focused on creating an inclusive social movement with its own identity. On July 1, a first wave of protest rallies, in which tens of thousands took part, swept across the country. Most of these protests had permits from local authorities and did not provoke strong opposition. At the same time, restrictions related to the football world cup did not allow for any public actions in Moscow, St. Petersburg and a number of other major cities. However, tens of thousands of people took part in them; the largest were the rallies in Omsk (4.5 thousand participants), Chelyabinsk, Tomsk and Komsomolsk-on-Amur. In different regions, they were organized by supporters of Navalny, local organizations of the Communist Party, the FNPR, and the “The People Are Against” campaign. Despite this effective unity of action, the protests against reform did not have the character of a mass social movement with which millions of passive opponents of raising the retirement age could have associated themselves. On July 18, the first rally in Moscow was held, gathering about 3,000 participants. Such a modest figure was largely related to the maneuvers of the local Moscow government, which only at the last moment agreed on the site for holding it (in the Sokolniki Park, which is remote from the center). However, based on the author’s personal observations, most of the participants in this rally did not belong to political parties and rather represented the category of “concerned citizens,” which is of fundamental importance for the representation of a potentially massive social movement. On this day, an action was also held in St. Petersburg, organized by a coalition of local opposition groups (mostly left-oriented) as part of the “People Are Against” campaign. By early August, the geography of the protests already covered more than 280 cities, and about 225,000 took part in rallies across the country (KTR rally map, 2018). However, by the end of July, the rallies became increasingly politically divided in character. The decisive blow to the apparent unity of action against reform was given by holding two competing rallies in the center of Moscow on July 28 and 29. The first one, gathering more than 10 thousand participants, was held at the call of the Communist Party and in general corresponded to the established political and organizational practice characteristic of this party. Most of the speakers were party functionaries (including the long-term party leader Gennady Zyuganov), who not only criticized the increase in the retirement age but also called for supporting party candidates in the upcoming regional elections in September. The organizers of the rally not only made no effort to create a new identity for the movement against the reform but also emphasized its continuity with their own regular practices of “protest actions.” In accordance with the organizational tradition of the KPRF, the initiator of such actions is always a “broad coalition” that actually represents a set of groups affiliated with the party that have no political agency of their own. Thus, on the eve of the rally, asked whether the party is ready to come out in a united front with other forces opposing pension reform, Zyuganov answered as follows: “We had 53 organizations during the discussion at the protest headquarters, including various unions— women, students, veterans, military-patriotic groups, writers’ organization, and so on. Anyone who wants to participate can do so, and we invite everyone” (Zyuganov, 2018). The rally held the next day (July 29) was organized by the Libertarian Party and publicly supported by Alexei Navalny (who, however, refrained from speaking at the event). It gathered fewer participants, most of whom, however, for ideological reasons, were not ready to take part in the Communist Party rally held a day earlier. Holding different politically-engaged actions at the end of July was an important argument for the government media, which portrayed their organizers as politicians using the issue of pension reform in their own interests. This premise, confirmed by the fact that the opponents of reform publicly lacked unity, seriously disoriented many potential participants in protest rallies, who were now afraid to be held hostage by alien political ambitions. Subsequent protests, planned by various political forces at the beginning of September, could no longer attract a significant number of participants who were not also part of the established support groups for the Communist Party or Alexei Navalny. An additional factor of disappointment in the protest was the effect of President Putin’s address on August 29, which we already mentioned above. So, on September 2, two simultaneous (!) 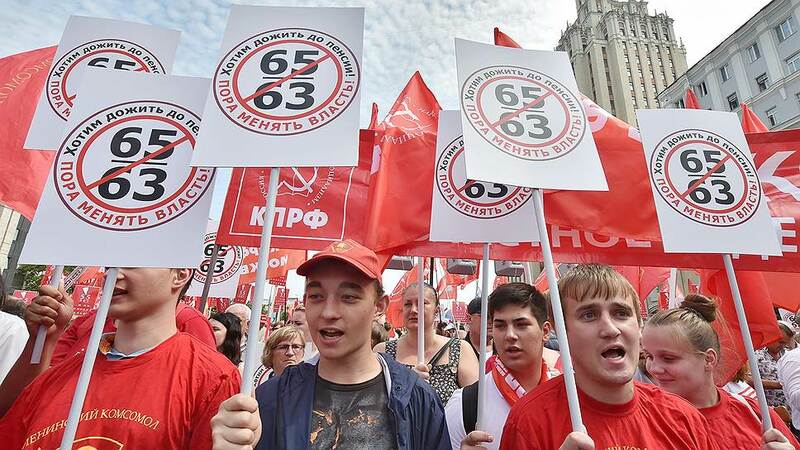 rallies were held against the reform in different parts of Moscow, one of which was organized by the Communist Party, and the second, by the parties “Fair Russia” and “Yabloko” and the “The People Are Against” campaign. Both meetings together could not reach even the numerical indicators of the Communist Party’s July action. Tellingly, these events were almost not covered by pro-government media (Gavalova, Obukhov, 2018). 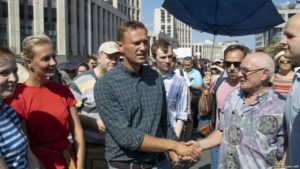 On September 9, protests called by Alexei Navalny took place in a number of cities, most of them without permits from the local authorities. These rallies, met with active police opposition and mass arrests, were largely identical, both symbolically and in terms of the composition of participants, to the anti-corruption actions organized by Navalny’s supporters in 2017 and early 2018. Despite the fact that, starting in late June 2018, Alexei Navalny himself placed criticism of pension reform at the center of his agenda, his audience remained largely unchanged. According to sociologists, “the politician is supported primarily by young, wealthy, educated residents of Moscow and major Russian cities”, for whom “in general, issues of social justice and pension reform are not very clear” (Volkov, 2018b). Protests by Navalny’s supporters, which are generally much more vibrant in character than the rallies of the Communist Party, also alienated a significant number of opponents of the pension reform (especially those of pre-retirement age) who were not ready to accept their confrontational character. Indeed, the results of the actions on September 9 fully confirmed the well-established link between Navalny’s calls to protest and the risk of arrest or beatings of ordinary protesters by the police. It was on this day that the authorities, to the greatest extent since the beginning of the movement against pension reform, discovered their characteristic “selective intolerance” (Sakwa, 2013, p. 220), rejecting in most regions permit requests for protests (OVDInfo, 2018) and conducting preventive detentions of their organizers (Voronin, 2018). A particularly high-conflict situation occurred in St. Petersburg, where the city government at the last moment changed its own decision and (probably under pressure from the Presidential Administration [Karpenko, 2018]) canceled an earlier permit for a rally. As a result, about 600 people were detained following the rally, all of whom were subjected to administrative detention. Smaller in scale but still quite massive arrests occurred in Moscow and other cities. An autonomous campaign against the pension reform organized in August by Sergey Kurginyan’s loyal patriarchal movement, Essence of Time, can be offered as an example of a curiosity typical of Russian “electoral authoritarianism” that starkly reflects protest management practices. Following their conspiracy theory, according to which Vladimir Putin is a hostage in the hands of hostile clandestine elites, Essence of Time activists on the streets of large cities gathered around a million signature for their appeal to the president asking to halt raising retirement age (Novaya Gazeta, 2018). 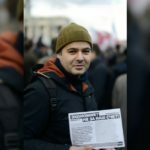 The result of this campaign was an even greater disorientation of the passive supporters of the reform, who struggled to understand the connection between their support of this appeal and the necessity of participating in public protest rallies. On September 27th, the pension reform bill, including amendments proposed by Putin, was passed after a third hearing by the State Duma. Within the next few days, it was passed by the Federal Council and then signed by the president. By that time, practically all political forces had ceased to conduct public campaigns against the pension reform. The events of summer and early fall 2018 surrounding the pension reform bill allow us to evaluate the position of each major political force that made a call for protest rallies. None of them was substantially interested in unity of action or in seriously expanding its audience beyond its current support group. According to Grigoriy Golosov, this “diversified strategy” is typical of the KPRF. The strategy is conditioned by this “para-state” party’s place within the current system of electoral authoritarianism and includes constant maneuvering in order “not to cause too much irritation to the Kremlin, on the one hand, and on the other, to strengthen its own electoral base” (Polovinko, 2018). The last task is fully consistent with the Communists’ call to hold a referendum on the issue of pension reform, towards which all the main forces of party activists were mobilized. This initiative, which was predictably rejected by the Central Election Commission (Hamraev, 2018), helped to set the dynamics of party activities against the reform and coincided with KPRF’s campaign objectives in the light of upcoming regional elections. At the same time, collecting signatures in support of the referendum set an alternative goal in relation to the need to influence voting results for reform in the Parliament, using street mobilization as an aid. These characteristics of KPRF’s political behavior were one of the main obstacles to a potential broad, non-partisan social movement against the pension reform. They also correspond to both the party’s specific position within an “electoral authoritarian” system and to the general features of this kind of system. British scientist Luke Marsh defines “electoral authoritarianism” as a “system of hegemonic parties,” analogous to the recent political history of Mexico or Taiwan. Within this system, opposition constitutes itself as “para-state parties acting within a framework of limited competition with the ruling party.” It is fundamental to acknowledge that “para-state parties” are not a pure fiction, but play an important institutional role with more or less relative autonomy. For example, they directly address society, representing an alternative point of view; and they are recruiting elements of the elites, thus providing “social elevators” outside the boundaries of the leading party. Generally, they stabilize the regime (March, 2009, p. 505) by acting as an organizer of political or social protests, on one hand, and by helping to “manage” those protests, on the other (Robertson, 2011, p. 5). This position assumes mobility on behalf of the para-state parties, with a limited right to a voice (Gvozdev, 2002, p. 493) that is predefined by its dependence on the regime. However, this role also grants parties some autonomy and makes them sensitive to any pressure from below. In other words, this is an element of hegemony that potentially could play a part in its destruction as well. In actual KPRF practice, this institutional contradiction is expressed in a combination of radical rhetoric and conservative practical methods. Thus, from the KPRF’s point of view, the pension reform corresponds to the interests of “big capital,” which is protected by the government (Postanovlenie Plenuma TsK KPRF, 2018). General party rhetoric includes an unwavering commitment to socialism, leaving political scientists no other choice but to classify the KPRF as a far-left party (March, 2012, p. 316). At the same time, the party explicitly considers electoral campaigns the main focus of its work, thus diligently preventing street protests from escalating. It is also worth noting that in their speeches against raising the retirement age, party leaders avoided directly criticizing the president, putting the responsibility on Prime Minister Medvedev and “liberal forces” in the government instead (Zyuganov, 2018). 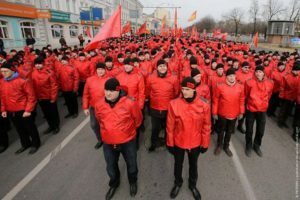 Within the framework of Russian “electoral authoritarianism,” the KPRF has traditionally represented those who not only will suffer the most from the pension reform but also are most likely to actually express their protest (primarily in the electoral arena). As sociologist Denis Volkov asserted, “the voters are very sensitive to excessive caution and palliative measures, and for this reason many people may not believe in the Communists’ sincere desire to defend their rights to the very end” (Volkov, 2018b). We can assume that, in a situation where there is significant pressure from below, the KPRF would have to change their usual practices and join the process they would be unable to control. Examples of this kind of developments can be found in the events of 2005, when, in order not to lose the initiative and its traditional supporters’ trust, local KPRF organizations had to actively support or even spearhead mass protests against the monetization of benefits, occasionally distinguishing itself by its radical methods. Nevertheless, it must be admitted that the KPRF’s structural place as a para-state party prevented it from participating actively in the creation of a broad public campaign against raising the retirement age, the principles and self-presentation of which would have directly contradict the party’s established practices and claims to a monopoly on social protest movements. Navalny against Pension Reforms (Courtesy of Radio Free Europe). Alexey Navalny’s organization, on the other hand, is not a part of the system “electoral authoritarianism” in any way, and the peculiar properties of its role in the pension reform protests were mainly determined by its direct confrontation with the government, as well as by its individual nature and hierarchic structure. Throughout the summer and fall of 2018, Navalny kept repeating that he and his proponents represent the sole consistent opposition to the pension reform while the KPRF and other opponents of the reform were only imitating resistance in order to please the authorities. This line is quite consistent with the political culture of Navalny’s organization, which is founded on a deep skepticism towards any coalitions or forms of collective decision making. In accordance with the well-known definition of populist politics (Laclau, 2005), Navalny has always acted as a figure that “constitutes” “the people” in its non-identity with the government—as “regular people,” opposed to thieves and corrupt officials. The task of resistance to the pension reform plans required revision of his ideological image and its related organizational practices, which tend to exclude working in coalition. In other words, this would demand from Navalny’s followers a more defined program, focusing on social justice, demands for income redistribution, and opposition to austerity policies, as well as being open to dialogue with independent trade unions, the radical Left, and social movements. Even a purely rhetorical call by Navalny for unity of action addressed to the parliamentary opposition could have significantly expanded his audience of supporters; it could have also encouraged the beginning of the public debate on a necessity for a joint campaign against the pension reform. Nevertheless, motions like this would have required Navalny to substantially amend his previous strategy, and he proved to be unprepared for this. In sum, both KPRF’s and Navalny’s organization did not contribute to the creation of a potential social movement against pension reforms for different reasons. The “The People Are Against” campaign, which was founded by independent trade unions, was obviously conceived as a prototype of such a movement. However, it could not create a common identity for all actions against the reform, nor did it manage to build an effective network of local activist groups that would be able to influence political leaders from below. Notwithstanding the combined political and social circumstances that impeded an appearance of large-scale movements against the pension reform and the government’s austerity policies, the absence of this movement in the summer and fall of 2018 was by no means preordained. Not only would such a movement have conveyed a preparedness to protest on behalf of a substantial part of the population, it would also have been fully in line with the global trend of mass protests against neoliberal reforms in labor and welfare policy. Translated by Kate Seidel, Ana Gurau, and Dasha Vodchic. Ilya Budraitskis (1981) is a historian, cultural and political activist. Since 2009 he is Ph.D. student at the Institute for World History, Russian Academy of Science, Moscow. In 2001-2004 he organized Russian activists in mobilizations against the G8, in European and World Social Forums. Since 2011 he has been an activist and spokesperson for Russian Socialist Movement. Member of Editorial board of “Moscow Art Magazine”. Regular contributor to the number of political and cultural websites. Andreasyan Z., Derluguian G, Armenia’s fuel protests. New Left Review, 95, September-October 2015 (https://newleftreview.org/II/95/georgi-derluguian-zhanna- andreasyan-armenia-s-fuel-protests). Balibar E.(2018) “Giletsjaunes”: Themeaningofconfrontation.(Interview). Verso (https:// www.versobooks.com/blogs/4191-gilets-jaunes-the-meaning-of-the-confrontation?fbc lid=IwAR00erEJ4rnpLkdd-xuuHc5xXDQJFjmJsnH25YbwcVrN_JDwtYd9-B87ooc). Brown W. (2006) American Nightmare: Neoliberalism, Neoconservatism, and De-Democratization. Political Theory, 34(6): 690-714. Chandler A. (2004) Shocking Mother Russia: Democratization, Social Rights, and Pension Reform in Russia, 1990–2001. Toronto: University of Toronto Press. Cook L. (2007) Post-Communist Welfare States: Reform Politics in Russia and Eastern Europe. Ithaca: Cornell University Press. Diamond L (2002) Thinking About Hybrid Regimes. Journal of Democracy, 13(2): 21-35. Ferre J.C. (2018) Argentina’s New Austerity. NACLA. Reports on America’s (https://nacla. org/news/2018/01/08/argentina%E2%80%99s-new-austerity). Finn D. (2015) Water Wars in Ireland. New Left Review, 95 (https://newleftreview.org/ II/95/daniel-finn-ireland-s-water-wars). Golosov G. (2011) The Regional Roots of Electoral Authoritarianism in Russia. Europe- Asia Studies, 63(4): 623-639. Gvozdev N.K. (2002) “Mexico and Russia: Mirror Images?” Democratizatsiya: The Journal of Post-Soviet Democratization 10(4): 488-508. Harvey D. (2007) Kratkaya istoriya neoliberalizma [The brief history of neoliberalism]. Moscow, Pokolenie. Hemment J. (2009) Soviet-Style Neoliberalism? Problems of Post-Communism, 56(6): 36-50. Hylton F., Thompson S. (2005) The Chequered Rainbow. New Left Review, 35 (https:// newleftreview.org/II/35/forrest-hylton-sinclair-thomson-the-chequered-rainbow). Kelsey D., Mueller F., Whittle A., Khosravinik (2017) The Discourse of Financial Crisis and Austerity: Critical analyses of business and economics across disciplines. Routledge. Kleman K., Miryasova O., Demidov A. (2010) Ot obyvatelej k aktivistam. Zarozhdayushchiesya social’nye dvizheniya v sovremennoj Rossii [From philistines to activists. Emerging social movements in contemporary Russia]. M.: Tri kvadrata. Laclau E. (2005) Populism: What’s in a Name? Populism and the Mirror of Democracy. L., N.Y.: Verso. March L. (2009) Managing opposition in a Hybrid Regime: Just Russia and Parastatal Opposition. Slavic Review, 68(3): 504-527. March L. (2012) Problems and perspectives of contemporary European radical left parties: Chasing a lost world or still a world to win? International Critical Thought, 2(3): 314-339. Matveev I. (2015) Gibridnaya neoliberalizaciya: gosudarstvo, legitimnost’ i neoliberalizm v putinskoj Rossii [Hybrid neoliberalization: state, legitimacy and neoliberalism in Putin’s Russia. Politia 4(79). p. 25-47. Mikhelidze N. (2015) #ElectricYerevan: Why Armenia’s Future is in Europe. Istituto Affari Internazionali (IAI) Working Papers, 1. Robertson G.B. (2011) The Politics of Protest in Hybrid Regimes: Managing Dissent in Post. Cambrige university press. Sakwa R. (2013) The politics of protest in hybrid regimes: managing dissent in post-communist Russia. Nationalities Papers: The Journal of Nationalism and Ethnicity, 41(1): 220-222. Sehnbruch K., Donoso S. (2011) Chilean winter of discontent: are protests here to stay? Opendemocracy (https://www.opendemocracy.net/kirsten-sehnbruch-sofia- donoso/chilean-winter-of-discontent-are-protests-here-to-stay). Tamas G.M. (2018) Revolt Against Orban (Interview). Jacobin ( https://www. jacobinmag.com/2018/12/hungary-protests-viktor-orban-work-overtime). Tilly C. (2004) Social movements 1768-2004. London, Paradigm pub. Treborn G. (2014) New masses? New Left Review, 85 (https://newleftreview.org/II/85/ goran-therborn-new-masses). Volkov D. (2018b) Predposylki osennih protestov [The background of the autumn protests. The plan of change] (https://planperemen.org/opinion/volkov/16082018). Wengle S., Rasel M. (2008) The monetisation of l’goty: Changing patterns of welfare politics and provision in Russia. Europe-Asia Studies, 60(5): 739-756. Будрайтскис И.Б. (2018) Российская пенсионная реформа и сопротивление: уро- ки отсутствовавшего движения. Социология власти, 30 (4): 69-105. Budraitskis I.B. (2018) Pension Reform and Resistance in Russia: Lessons from the Movement that Failed to Happen. Sociology of Power, 30 (4): 69-105.